On Aug. 6, 1945, during World War II, an American B-29 bomber dubbed “Enola Gay” dropped the world’s first deployed atomic bomb, nicknamed the “Little Boy,” over the Japanese city of Hiroshima, killing approximately 110,000 Japanese citizens. 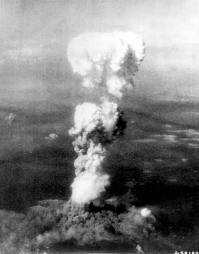 Three days later, the U.S. dropped the second atom bomb on Japan, at Nagasaki, leading to Japan’s surrender in WWII. The U.S. had originally planned to drop the bomb, nicknamed “Fat Man,” on Nagasaki on Aug.11, five days after the first was dropped on Hiroshima, but weather forced crews to move the mission up two days. The B-29 Bomber, nicknamed “Bock’s Car,” took off at 1:56 a.m. from Tinian Island and headed toward Nagasaki. The 10,200-pound bomb was dropped at 11:02 a.m., killing an estimated 40,000 people. The U.S. also had a third atom bomb ready to be dropped, if necessary. Recently, The Atlantic looked back at how the U.S. justified dropping the bombs, citing an article published just a year after Hiroshima. In December 1946, just over a year after Hiroshima, The Atlantic published Dr. Karl Compton’s article, “If the Atomic Bomb Had Not been Used.” Compton argues that if the United States had not implemented the Manhattan Project, hundreds of thousands more lives — both American and Japanese — would have been lost. President Truman — who called Compton’s article, “the first sensible statement I have seen on the subject” — expressed his support for Compton’s position in a letter published in The Atlantic in February 1947. Together, Compton’s article and Truman’s letter explain how the U.S. government justified its decision to cause massive destruction on a scale the world had never seen before. Read more from The Atlantic’s findings here.